Welcome to my very humble website. I find the rigors of tweeting and instagramming to be above and beyond my desire to be seen or heard, so keeping some schmantzy, link-filled, image-heavy webpage is just not going to happen. If you click on the “My Blog” link, you will see I haven’t been able to do much with that, either. I do have Facebook, and you are welcome to friend me there. Life is zipping by at an astonishing pace, and keeping up with it leaves me very little time to write about keeping up with it. Little Zuzu, who has gone by Sara since she was 4, is starting her freshman year of high school, and is a wonderful, creative, helpful, loving, funny young woman who I adore. Josie is in 6th grade, and is brilliant, talented, cuddly, and hilarious. Randy and I are still besties, and we are still working on our middle reader sci-fi book, which is nearing completion at last. Stay tuned. 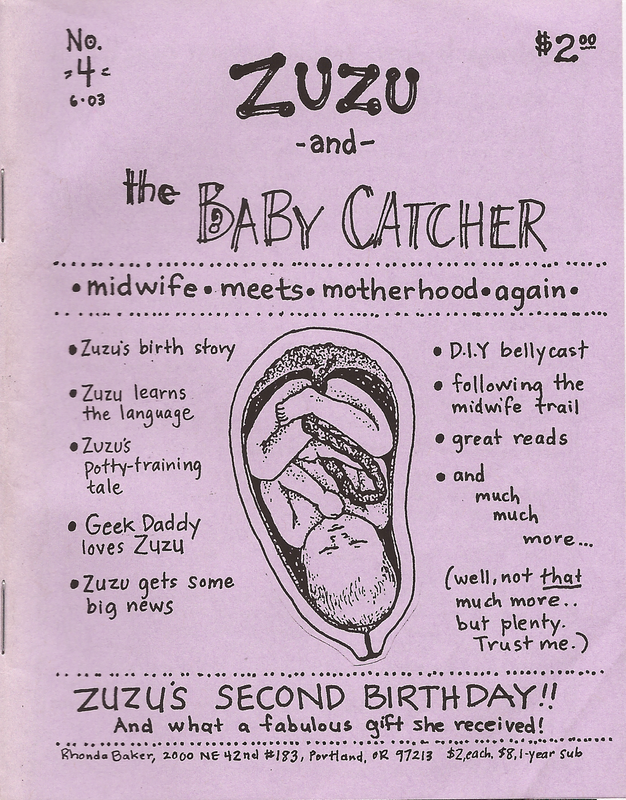 Meanwhile, if you have found your way here looking for my old zine, “Zuzu and the Baby Catcher”, you are in luck! It’s all here, for free. I scanned in all the issues, and now you can read them, download them, print them out, whatever your heart desires. I did not bother to pretty them up – I started to, I confess – but I decided to just leave them as raw as ever they were. Click on the issues you want to read. Right click on the PDF and choose Save As to download to your computer. Payment is not required, but is very much appreciated. Enter the amount you want to pay via credit/debit card, checking account, or Paypal account, click the Buy Now button, and you'll be taken to the Paypal site to complete the transaction.